This episode of Critical Insight we were joined by Kali Akuno of the Malcolm X Grassroots Movement to discuss their 2012 report detailing the fact that every 36 hours (at least) a Black person is extra-judiciously executed by "Law Enforcement" within the United States. 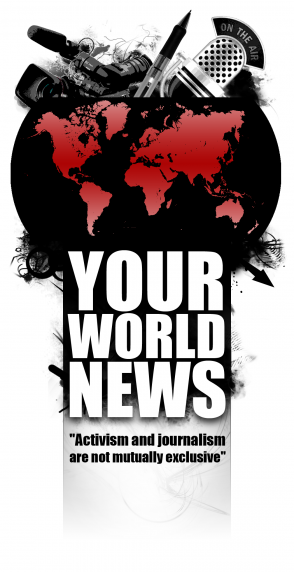 Please watch this episode to to hear Mr. Akuno discuss the more recent developments regarding this report, how the corporate media has tried to marginalize it, and what you can do to help make a positive impact. Your support is needed----started by clicking the video link below or above, and spreading the word about this human rights crisis. NEW YEAR'S GREETINGS FROM THE CUBAN 5! Another year of intense effort of solidarity with the struggle for our freedom is coming to a close. Countless have been the actions, demonstrations and palpable results of the work by all of you in different parts of the world. The vigor of your solidarity is evident. If a few years ago our situation was almost unknown, today, thanks to you all, to your tireless work and initiatives, the information about the case of the Cuban Five has reached almost all corners of the universe, in politics and society. There is still much to do, although not for lack of your efforts, but rather, because of the stubborn opposition and obstacles by powerful forces who conspire to maintain our reality in absolute silence. Nevertheless, we have confidence in your humane quality, in your wisdom and commitment as activists, and in your inexhaustible spirit of solidarity. We know we can count on you and that you will accompany us until together we reach our goal: Freedom and the return to our homeland and our families. May our most profound gratitude reach each one of you in the city or town of the universe, from where you extend your solidarity. Many thanks for your support, much success in 2013, and best wishes for the new year. 2012 is coming to an end. As I meditated on how to express to you our eternal appreciation for all your support; and our deep admiration for your dedication to the most noble and just causes in the world, these verses came to my heart which I dedicate to you all on behalf of the Cuban Five. todo lo mio es tuyo. toda la luz del mundo. !Viva la Revolucion en su 54 aniversario! This year 2012 is reaching an end and we want to use this special opportunity to express how proud, grateful we are for counting on your support, love and brotherhood. A cultural/political evening of celebration and solidarity presented by The ProLibertad Freedom Campaign and Casa de las Americas! Dedicated to the FREEDOM OF THE CUBAN 5 AND THE PUERTO RICAN POLITICAL PRISONERS! Join us as we celebrate the 54th anniversary of the Cuban revolution anniversary and the 70th Birthday of Puerto Rican Political Prisoner Oscar Lopez Rivera! The BEST in all kinds of Latin Music, Hip Hop & more! Kulcha Village, the Afrikan Market day catering for all Black Businesses is back for two dates in December, in celebration of Kwanzaa and the rest of the festive season. Kulcha Village brings together a wide range of businesses showcasing the finest Afrikan inspired clothing, shoes, DVD's, books, health and beauty products and much more. Our audience are always enthusiastic, vibrant and know good quality when they see it. We would like to give all our Afrikan (Black) Businesses a chance to take advantage of this opportunity. There are limited stall spaces available. Event details are as follows. [TheBlackList] Jan. 5th Three Kings Event for the Cuban 5 and the PRican PPs! then we unite, on the basis of what we have in common…"
TO HONOR POLITICAL PRISONERS, THEIR FAMILIES! 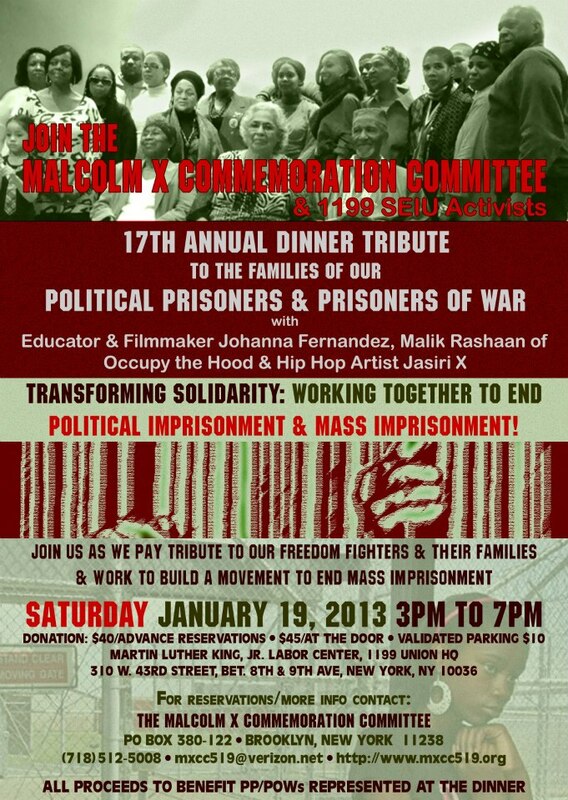 On Saturday, January 19th, the Malcolm X Commemoration Committee and the 1199 SEIU activists will host its 17th annual dinner tribute to our political prisoners and their families! This highly anticipated and moving event will take place at the Martin Luther King Jr. Labor Center, 1199 Union Headquarters, 310 West 43rd Street, (near 8th Avenue), in Manhattan. The event will be from 3-7pm with dinner served promptly at 4pm. Donations for this now time-honored event are $40 in advance and $45 at the door. Proceeds from this gathering go to the commissary of the political prisoners who are represented at the dinner by their families. The theme for this year's dinner is "Transforming Solidarity: Working Together To End Political Imprisonment and Mass Incarceration." "At some point it becomes important to recognize that it is not enough to say 'I am doing something.' At some point, we have to figure out just what must be done to get results," she finished emphatically. Special guests presenters for this year are Johanna Fernandez, producer of the critically acclaimed film 'Justice On Trial,' about Mumia Abu-Jamal, Malik Rhasaan of Occupy The 'Hood and people's hip hop artist Jasiri X! This year's dinner comes on the heels of Mumia Abu-Jamal's death sentence being tossed and on the heels of political prisoners like Jalil Muntaqim being denied parole again. Muntaqim has been in prison since 1973. The Malcolm X Commemoration Committee was launched in 1993 with former political prisoner Herman Ferguson serving as chairman. Ferguson, now 91, was also a founding member of the Organization of AfroAmerican Unity with Malcolm X and was with him up until that fateful day February 21, 1965, when Malcolm was tragically assassinated. In addition to combatting misinformation surrounding the legacy of Malcolm X and multiplying the presence of the community for the very moving annual pilgrimage to Malcolm's gravesite on his birthday, the Committee also initiated this dinner 17 years ago to bring the community together to build greater support for Black and New Afrikan political prisoners and to instill greater appreciation for their humanity and for what their families have to endure in the face of their wrongful incarceration. The Malcolm X Commemoration Committee has always said that Black and New Afrikan political prisoners, who were young men who were directly inspired by Malcolm to join the Black Liberation Movement, make up "the hidden legacy" of Malcolm X. Many were viciously targeted by the government's COINTELPRO operations of the late 60s early 70s. Those operations assassinated activists, framed activists, fostered violence between activists and the police and even fostered violence between activists themselves. To this date, there are dozens of political prisoners and prisoners of war who are still in prison from frameups dating back to the 60s in most cases! PEOPLES ORGANIZATION FOR PROGRESS MARCHES INTO HOLIDAYS! POP HOSTS KWANZAA ON DEC 27TH, KUJICHAGULIA! On Thursday, December 27th, the Peoples Organization For Progress will host its 2012 Kwanzaa Celebration from 6-9:30pm at Mt. Pleasant Baptist Church, 100 Montgomery Street, Newark. During the height of the Black Liberation Movement, just as Newark played a major role in applying the politics of Black Power to the ballot, Newark also played a significant role in developing and implementing Kwanzaa under the leadership of Amiri Baraka. Kwanzaa is a seven day celebration from Dec. 26th to Jan. 1st that affirms African culture. Each day is devoted to a principle. The seven principles together are called 'the Nguzo Saba,' or the Seven Principles in Swahili, the language of this celebration. This gathering will take place on Kujichagulia, Swahili for 'Self-Determination, day two of Kwanzaa. Families are encouraged to attend. Adults are encouraged to bring young people to this moving gathering. Admission is Free. Participants are asked to bring a dish to share. "We just started hosting our own Kwanzaa celebrations just a few years ago, and every year, they are always standing room only," beamed Lawrence Hamm, fondly. POP MARCHES FOR MARTIN LUTHER KING AND ECONOMIC JUSTICE! On Saturday, January 19th, the Peoples Organization For Progress, along with many other organizations will march and rally for jobs, economic justice peace to observe the birthday of the immortal Martin Luther King Jr! Participants will assemble at the Lincoln Monument on Springfield Avenue and West Market Street in Newark at 12 noon. "The Peoples Organization for Progress is not going to stand by and watch the federal and state governments allow the people to be pushed any further toward any fiscal cliff without a good, old-fashioned democratic fight," said Lawrence Hamm emphatically. The struggle for jobs, peace and economic justice continues," he finished. Martin Luther King Jr. was born on January 15, 1929. He is best known for his leadership in the Civil Rights Movement, spearheading bold, nonviolent direct action campaigns which were crucial in ultimately ending public segregation and the denial of voting rights for African-Americans. In his later years, right on up to his assassination on April 4, 1968, he also became a leading spokesman and advocate for economic justice and world peace. This underappreciated dimension of his legacy has been anchoring recent economic justice campaigns by the Peoples Organization for Progress. GET ON THE BUS FOR THE INAUGURATION OF PRES OBAMA! On Monday, January 20th, the People's Organization for Progress is again taking a bus to the Presidential Inauguration of President Barack Obama! The cost for each seat is $55.00. The bus will leave from Lincoln Park, Newark at 5am. Last night, Saturday December 15th 2012, at around 5pm in East Harlem (El Barrio), two members of the socio-political Hip Hop fusion band, The Welfare Poets (Michael Pacheco - The Legendary M.I.C. and Keith Hughes - Dahu Alah), along with their film crew Ricky Turner and Wander Acosta (who are also members of the Hip Hop group Lower Class Citizens) were arrested while filming a music video at the NYCHA's James Weldon Johnson Houses by NYPD for criminal trespassing, a misdemeanor. Additionally Iz The Truth (Israel Balleto) of Guerrilla Republik (a progressive Hip Hop clothing company and organization in which the Welfare Poets are directly a part of) and Boom Box were also arrested. The Welfare Poets were filming footage for an upcoming music video. In a case like this, anyone arrested is booked at a precint (in this case, the NYPD Service Area #5) and sent downtown to Manhattan Central Booking to be processed -- for a misdemeanor a normal person would be out in less than 24 hours. Although this might be the case for the two Welfare Poets and the others who were with them, what makes what happened here different is when they were all initially stopped by the cops, the police officers said they would probably be given a summons and released without going to the precinct. Once the cops found out that the collective were part of The Welfare Poets, the officers started claiming that the group was connected to Los Macheteros and how they knew about them (The Welfare Poets) -- how they have has their eyes on the collective for some time. The officers called their sergeant and it was decided to arrest the six and take them to the precinct to be booked and eventually sent downtown for further processing thru central booking where they would face an arraignment judge. At least seven cops came to arrest group. Los Macheteros (Machete-Wielders) are a clandestine militant organization based on the island of Puerto Rico. They campaign for, and support, the decolonization and independence of Puerto Rico from the United States. In 1983, Los Macheteros were accused of stealing approximately $7 million from a Wells Fargo depot in West Hartford, Connecticut. The money obtained from this operation was allegedly used to help fund the Puerto Rican independence movement. On September 23rd 2005, the FBI assassinated its leader, Filiberto Ojeda Rios claiming it was an attempt to serve an arrest warrant on him, who the surrounded his house in Hormigueros, Puerto Rico. We are urging anyone and everyone to first spread the word virtually through all your available means, and then to call down to 100 Center Street, the Manhattan Criminal Court Building and inquire about these brothers. The Welfare Poets are long time community activist and educators in addition to being artists committed to addressing and improving the conditions of oppressed people everywhere. Their unwavering commitment has made them targets over the years to units like the Hip Hop Police and the NYPD in general. Whether at a rally, on death row, in a school or the community in general, The Welfare Poets have been there for all without compromise. In the end, if you can head down to the courthouse in lower Manhattan at 100 Center Street today (now!!! ), please do so. If you are a lawyer and know of the work that these brothers (and sisters) do, have done and will continue to do, use whatever means you have to reach out on the behalf of all these individuals. We will not let our community artists be harassed by this repressive police force or any/all repressive forces in this country. To head down there in person right now!!!! Take the No. 4 or 5 train to the Brooklyn Bridge Station; the C, N, R, 6 train to Canal Street; the 1 train to Franklin Street. Take the 1, 6 or 15 bus line. For a DONATION of $25.00, we will send a year subscription! From: Rev. Ronald V. Myers, Sr., M.D. Congratulations to our Oregon Juneteenth State Directors, Harvey Rice and Doris Rush, on your successful efforts to get your two U.S. Senators to co-sponsor S.J. Res 45! TELL YOUR TWO U.S. SENATORS TO SUPPORT S.J.R. 45! to designate June 19 as "Juneteenth Independence Day"
Juneteenth Independence Day as a National Day of Observance! BY THE SENATE JUDICIARY COMMITTEE AND THE ENTIRE U.S. SENATE!